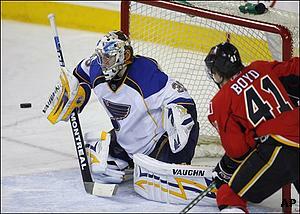 March 10, 2008, the Calgary Flames played the St. Louis Blues and won 7-3. Considering the on and off of the flames, this is not too bad, and the fact that they won….seemingly so easily, makes a person wonder if they are going to make the playoffs, and actually be able to do something once they are in it. Jarome Iginlascored his 365th, passing Theo Fleury atop the team’s all-time list. The Flames’ captain one-timed a pass from Kristian Huseliusand had the puck go in off the backside of Blues defenseman Eric Brewer and behind Manny Legace at 18:27 of the first period. 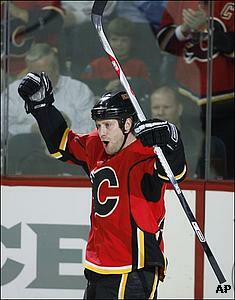 Alex Tanguayhad two goals and Huselius, Matthew Lombardi, Marcus Nilson and Daymond Langkow also scored for the Flames. Brad Boyes scored twice and David Backes added one for St. Louis. Calgary now heads out on a four-game road trip as the leader in the Northwest Division. A 7-1-2 run has them one point up on Minnesota and two ahead of Colorado. A few season ago we saw the Flames barely on the cut of making the playoffs. The Flames were playing the Oilers waiting to hear on another game that would tell them if they would have to overcome the Oilers or if they could take one more loss before the Playoffs started. Well, guess what? They didn’t win the Edmonton game, got into the playoffs and didn’t do anything with it. It was practically an embarrassment to Calgary. But every team has its highs and lows. 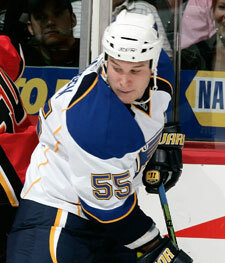 Next Game: Wednesday March 12, 2008 in Washington, against the Capitals.